Near the front entrance of my local library, there's a shelf full of romance novels. I usually pass by it without even noticing it, but today, something caught my eye. 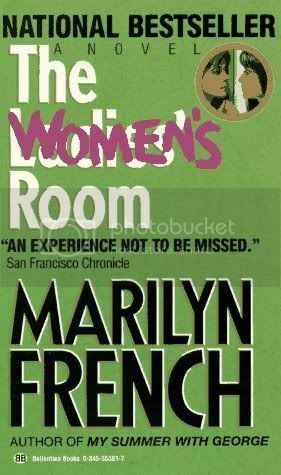 Right in the middle, surrounded by paperbacks with corseted women submitting to Fabio-like men on their covers, was Marilyn French's The Women's Room. I think I was 14 when I read that. It had a powerful effect on me, and it made me look at my mother's generation in a different light. It's depressingly still pretty relevant for a 30 yr old book.